Anyone that reads this blog regularly knows that I love soup. It is probably one of my favorite foods and I could literally eat it twice a day. My two sons are the same way. At dinner tonight they informed me that they weren't hungry and therefore not eating. After they had the soup in front of them they happily ate their whole bowls. In the last couple of months my husband has decided that he wants to lose weight and I have been making a conscious effort to make more low-fat meals. Soup is a great way to incorporate lower calorie foods and I have been experimenting with a number of recipes. When I was looking through the April issue of Bon Appetit magazine the recipe for Spring Minestrone with Chicken Meatballs caught my eye and it looked low in calories and delicious. This recipe has 13 ingredients. It takes 45 minutes of total time, all of which is active and makes 4 servings. I had no problems finding any of the ingredients at my local grocery store. I chose to leave off the chopped fresh basil topping, my basil went bad in the fridge and I chose not to purchase more. I made my chicken broth from scratch like I always do. Stock from scratch tastes so much better and is a lot cheaper! The recipe states that it makes 28 meatballs, I found that I only made 17 meatballs. in total. I like larger meatballs so that might be the reason. I let the finished soup cook for around five minutes to ensure that the meatballs had fully cooked. I followed the remainder of the recipe as written. The flavor of this soup is absolutely delicious. The broth tastes almost similar to the broth in wonton soup, it really has a lot of taste. My husband and two boys were huge fans of this soup and ate multiple servings. I found that this recipe made more than the four servings suggested. It made enough for dinner for my family of four plus leftovers for lunch the next day. 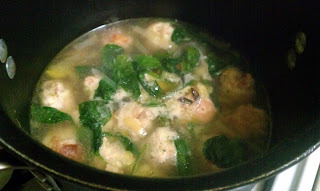 This is a soup that I will definitely make again! 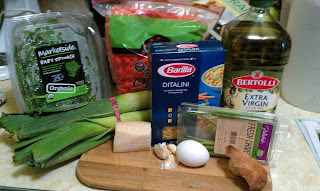 For the recipe go to Spring Minestrone with Chicken Meatballs. Thanks :) The broth and meatballs were delicious! What a lovely soup. It's getting wintery here and soup's good! Thanks :) It was very easy and the flavor was delicious! I agree, soup in the winter is perfect! I love the broth in wonton soup, so I'm sure I'll love this, too! I love soup and besides it looks beautiful. The other great thing about making your own chicken stock is that you can control the salt, which is a big thing in our house. Thanks, Frugal! I agree about controlling the salt, store bought stock can be very high in sodium. I try to limit the amount of salt that my family eats since high blood pressure runs on both sides.